This article is not only written for those of you who feel a little skittish around foreign terms like Crianza and Gran Reserva, but also for those self-proclaimed wine experts who think they’ve got the Spanish nomenclature of aging down flat. In Iberia, the terminology is defined by each Denominacion de Origen (see definition below). Therefore, what Crianza may mean to one region cannot immediately be transferred to another region. So what I’d like to do is provide you with a guide to the terminology you’ll find specifically on a Rioja wine label, as well as some general Spanish wine terminology you can practice during your next trip to the wine shop. The name of the producer. When the bodega was originally founded. The location where the wine was elaborated. The year the wine was made. The amount of time the wine spent in the bodega, indicated by the terms joven, crianza, semi-crianza, reserva, gran reserva. Although infrequently listed, you may run into the type of grapes used in Rioja to make the wine. Throughout Spain, wines can be classified into three distinct categories: 1) vino de mesa – table wine, 2) vino de la tierra – regional wine, and 3) vino de calidad – quality wine. 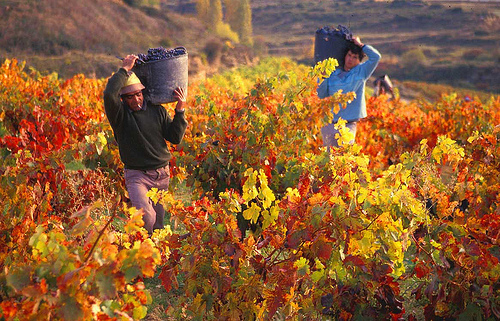 Rioja is unique in that you will only find wines rated as vino de calidad, or quality wines. Within the quality wine classification, wines are further divided into Denominaciones de Origen (DO) or Denominaciones de Origen Calificada (DOCa). DO defines specific wine growing areas such as La Mancha, Ribera del Duero etc, whereas DOCa are regions rated of the highest quality over a long period of time and currently only include Rioja and Priorato. However, it is worth noting that although many Vino de la Tierras are of excellent quality, not all Riojas are of equally high quality. In Spain, aging regulations are referred to as Crianza, a generic term used to indicate aging in both bottle and barrel. The term Crianza literally translates to “upbringing” or “breeding”, used in the same way as you would use it with a child, inferring that a wine needs time, attention and love (do I dare use love with wine!) to evolve into a fully developed, mature wine. However, Crianza also refers to a specific aging period, as further explained below. Joven: The term joven means ‘young’ and refers to an inordinate amount of styles intended for immediate drinking. Generally, these wine have either been aged for a short period in oak (a few months) or have never seen oak at all. The bargains here tend to be found in wines that are soft in the mouth and food friendly. It is also worth mentioning that 90% of all white and rosado wines from Rioja fall into the joven category. Corta-Crianza, Semi-Crianza, Roble, Fermentada en Barrica, ‘X’ Meses en Barrica: These are all terms used to describe wines that have been placed in oak barrels for a few months less than the regulatory requirements. With this definition, you may question the difference between a Joven wine and a Corta-Crianza? A joven may never see oak, but a Corta-Crianza will always see some oak. This terminology can be a good indicator of a well-made wine, though nowadays, the movement away from oak has opened up a wide range of fresh vibrant wines to the market. Generico: Is generally used by modern winemakers and for “new-wave” wines. Because modern Rioja winemakers don’t want to associate their wine with the traditional oaky style, they’ll slap this term on the label as a form of defiance and difference, while new-wave wines use it for its trendiness and popularity irregardless if the wine has seen a two years of oak. I doubt we’ll come across the classification ‘generico’ in the following months, but if by the off chance we do, I’ll be sure both highlight it in the newsletter and provide additional information as to why the producer consciously chose this term. Crianza: Wines aged for 2 years with a minimum of 12 months in oak and 12 months in the bottle before being sold. These wines tend to have more body and strong acid helping them to pair well with your heavier foods – think roast meats and rich sauces. As for the infrequent white or rosado wine that are termed Crianza, these wines are required to spend at least 6 months in oak and 6 in bottle. Reserva: Wines are aged for 3 calendar years with a minimum of 12 months in oak and 24 months in the bottle. Increasing in age, you can expect to find rich and concentrated wines tending towards a silky flavor after softening with age. We like these wines with delicately roasted meats like the renown suckling lamb. White and rosado wines must spend at the minimum of six months in oak and and a one and half years in bottle. Gran Reserva: These wines are aged for 5 years with a minimum of 24 months in oak and 36 months in the bottle; however many gran reservas will spend several more years aging before being released. For many, these are perceived as the pinnacle of Spanish wine – even though in the past, they were often overly oxidized and woody. Today, we are starting to see more care used in the crafting of these wines and as a result, there often is a magical blending of both the oak and the fruit. At their best, Gran Reservas can develop in your mouth bringing forth new and exciting flavors with every sip. White and rosados must spend at least 4 years in the bodega, of which six months must be in oak. Lopez-Heredia produces one of the most notable examples of a white Gran Reserva called, Vina Tondonia. As mentioned above, the majority of regions follow these guidelines proudly, however the specifics can change slightly from one to the next. Additionally, with the surge of new-style wines hitting the market – choosing to adhere to their own aging processes, traditional methods have occasionally taken back seat to innovation and technology. ***What is mandatory on the back of every Rioja bottle is a sticker, as seen here, certifying its origins and its aging. If you’re lucky, you will find the information in English; however, I cannot promise decent translation. What I feel is most important to keep note is that although classic Rioja wines are known for their big toasty oak flavors and mature Tempranillo fruit, times have changed. What you may have associated with a Rioja wine, fermented and aged in oak, is now fermented in stainless steel tanks to promote minimal oak and maximum fruit, before it ages in barrel. In addition, winemakers who want high extraction, will now macerate their wines for up to 30 days in order to obtain big structure, fine tannins and high levels of alcohol. This style may not be everyone’s cup of tea, they are providing Rioja will a multitude of styles that fit a wider variety of palates. That said, if you’re keen to have a Rioja wine experience personalized just for you, complete with regional foods, history, and nature, let us know! We’d love to ensure your experience is memorable. Book a Wine Tour in Spain with Us!